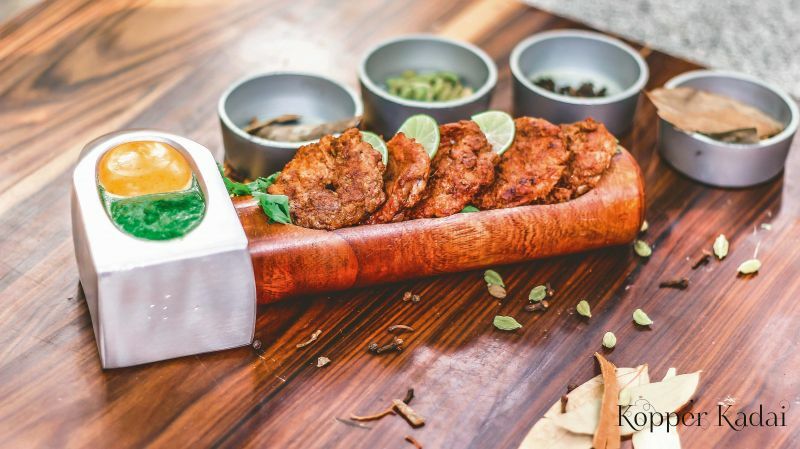 Delhi's flavour now in the heart of Bangalore! Fruit cream has been one of those quintessential desserts that bring the entire experience of Delhi rushing to mind. 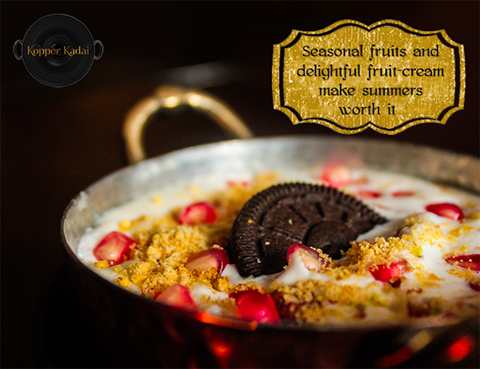 Try our Dilli Wali Fruit Cream today! 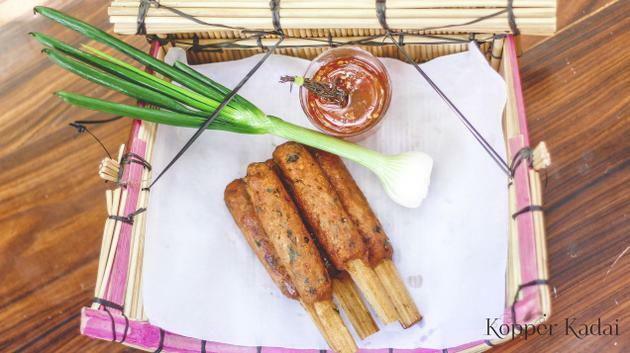 Try "Challi Kolmi Kebab" at Kopper Kadai! Ghee for frying and salt to taste. Pat dry the lamb chunks and flatten with a hammer or a meat mallet. Prick with a fork, apply ginger-garlic paste, lemon juice, malt vinegar, raw papaya paste, salt and leave for two hour. For second marination, take hung yogurt in a bowl, add cumin powder, garam masala powder, pepper, coriander leaves and mint. Heat mustard oil in a pan and add degi mirch and remove. Mix with oil, chili paste with yogurt marination. Now, apply above marinade to lamb meat, which was in first marination, and allow to rest in the refrigerator for two days. Cook on a flat grill on medium heat and serve hot immediately on a hammer. Inspired from a hammer that one maintenance worker was using when I was writing the menu for Kopper Kadai. This one includes interesting spices like Patthar key Phool, Balchar, Bedi Chillies, Mustard, Nagarmotha among others, all used in ancient Indian cuisine for dawats. What could be out of the ordinary in a street packed with eateries? You would think so when you stroll down the lane where Jyoti Niwas College is located in 5th block, Koramangala. 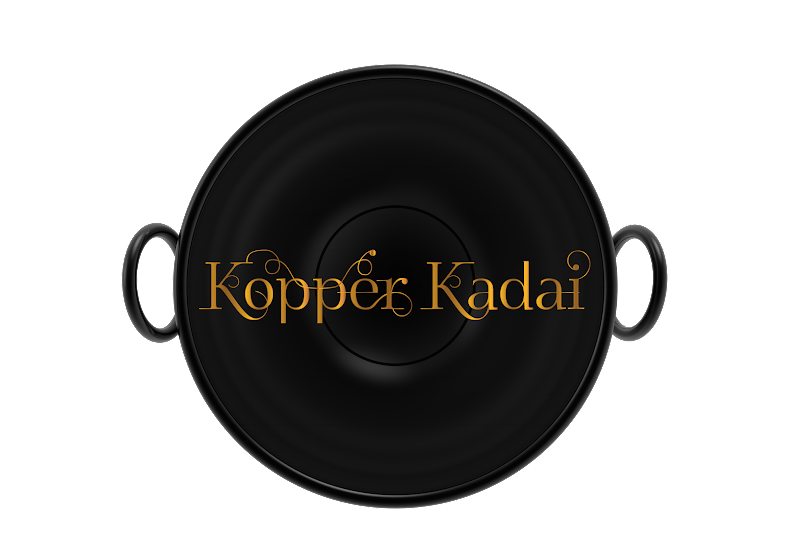 But then Kopper Kadai, which opened recently, is an exception. It has been in the news for receiving a special mention by the Masterchef judge, Matt Preston, who was in the city recently, and has received good reviews. These factors and the fact that it had been conceived by celebrity chef, Akshay Nayyar, piqued our curiosity. This was a restaurant that had to be visited. As we enter the restaurant we are informed it’s fare of the North West Frontier Province. 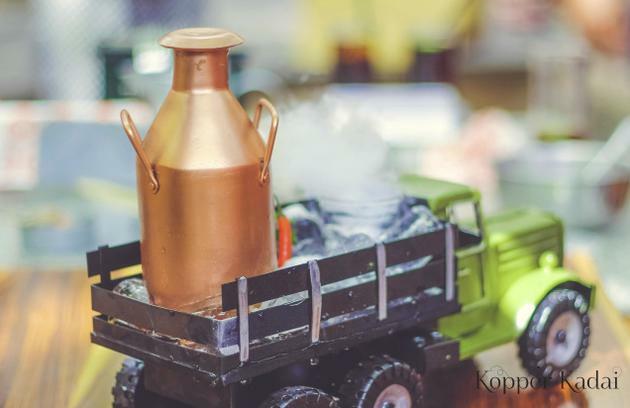 Copper is the dominant theme of the restaurant, from the utensils and decor to the general colour, interspersed with hues of rust and bottle green. It is spacious and quite packed. But the restaurant has been designed such that the tables are set apart so as not to block passageways and intrude into the personal space of other diners. The entrance has 172 hanging copper spoons symbolising the spices used for cooking, all of which they claim are hand-made. At one end are copper handis fitted onto a device that has warm water flowing under the handis, a cooking process which keeps the food fresh. The old-style and sophisticated furniture and cutlery are all customised. The sherbets--alcohol is not served here--are worth a try. We sample kiwi ambi panna, made of smoked raw mango, gooseberry and green chilli, masakali, a frozen lemon drink and chatmolafatafat, a combination of cola and jaljeera. It was hard to choose which was tastier. Each has a distinct taste. We find even more uniqueness in the way the food is served. Patiala hari mirch fried chicken (PFC), a fitting reply to its American counterpart, is served in a mini-sized truck! An upturned umbrella, charpoys -- it is entertaining to see the varied serving dishes. We next sample the soya bean chaap, which isn’t all that wonderful. But the Lucknowi dahi ki shammi, which is yoghurt patties with a hint of ginger and chilli, made up for that disappointment. We couldn't wait to savour ganna chicken. This minced chicken kebab served on marinated sugar cane sticks with sweet and sour sauce was hailed by Masterchef judge Matt. And you would know why as this was one of the best dishes of the evening. 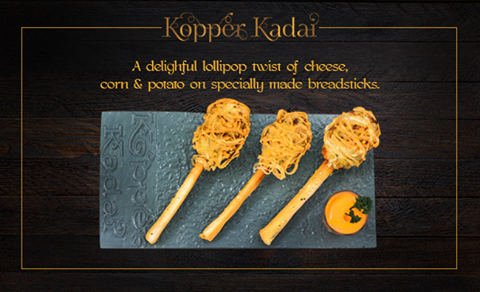 The sugar cane stick lends a truly outstanding twist to it. Kebab number 4, Kiari kebab, a Kopper Kadai signature dish, lamb kebab served in Indian white sauce, was also delicious. The main course has a range of curries and biriyani to choose from. The dessert, though, was the icing on the cake. We were served Batessa cake, similar to son papdi, but layered with mawa. It left us speechless. 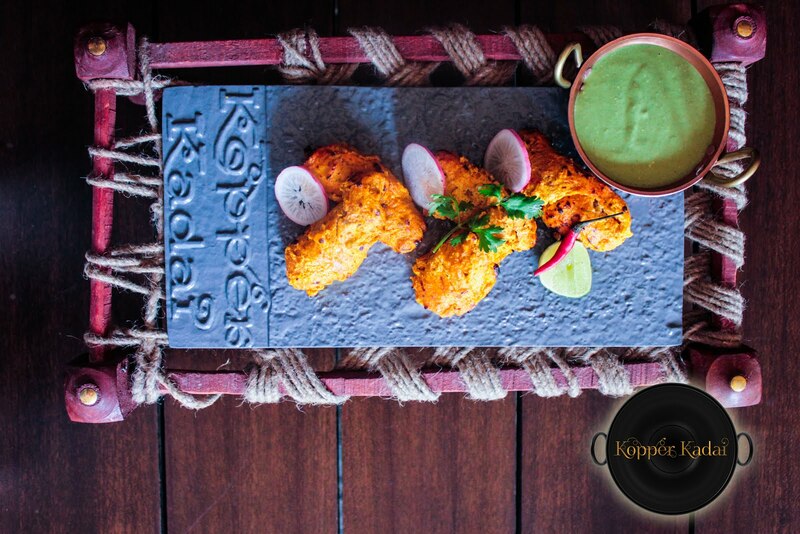 After the experience at Kopper Kadai, we knew why it is still among the highest rated restaurants on Zomato in the city.